xiè is a unit comprising the poetry reciter and dancer, Keisei, and the sound designer, Hagi. 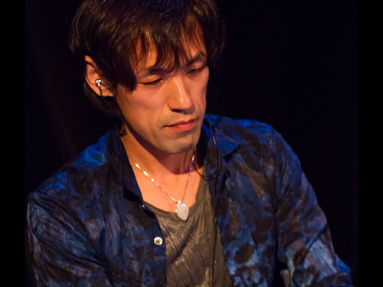 Keisei’s superb recitation techniques and expressive ability are made one with sound through Hagi’s meticulous programming, creating a vast and highly detailed soundscape. Poetry recitation is a traditional Japanese art, known as shigin. Shigin is usually performed accompanied only by the koto (zither) and shakuhachi (bamboo flute). xiè’s fusing the voice with computer programming-generated ethnic and ambient sounds is therefore a first, giving rise to a new style of the art. with Keisei’s ideas xiè expresses a poetic world unbound by conventions. to convey the very heartbeat of music, and make it felt profoundly in all who listen. Brought up with a father who recited shigin poetry, Keisei began learning shigin from age 3. Began studying dance at age 9, and winning various awards in nationwide contests. Subsequently revived her shigin and dance activity in order to bring the magic of shigin poetry and kenbu sword dancing to as many people as possible. an artist expert in creating ambient and ethnic-inspired sounds. Set out to create a new genre of children's shigin by working shigin into songs for children. Gained prominence in her quest to introduce a new style of shigin for the present generation, taking shigin from its traditional roots and investigating new possibilities for it. Collaborated with artists of numerous different genres in this project, performing with them in live underground venues. Hagi is an artist who is seeking the integration of digital and acoustic sound, and who expresses his own unique vision of the world through music. By reinterpreting the traditional music of several regions of the world, Hagi is trying to project the breath of nature and the soul of the land into the digital world. Hagi’s music is used in TV commercials, films, and Tokyo fashion show etc. He also makes music for Jibo, a project based on ancient Chinese characters. His activities in music transcend genre and nationality. In addition to composing his own music, he is highly regarded as an arranger. In particular, he has a reputation as a programmer, arranger and remix sound artist for music that incorporates elements of the traditional. Reviving shigin poetry recitation—the rarely heard echoes of Japan. Not even many Japanese are aware anymore of shigin and its tonal colors. Hagi, Xiè's sound creator, himself began knowing little of it. his notion of shigin as drab and monotonous was completely turned on its head. and evocativeness of their very Japanese tones and echoes. Hagi's desire is to bring this evocative art to people in new, exciting forms. And from there, Xiè came into being. The new sounds of Xiè will surprise home audiences, and stir those new to things Japanese. In 2013, the shakuhachi player, Soh Tanomura, joined Xiè, further enriching the unit's sound. And Xiè's sound is set to evolve further as more artists join, growing in beauty and power. Copyright q-on. All Rights Reserved.